We have been blessed by God with our talents and God's abundant love. Now we'd like to share our talents and witness to God's love all over the world. 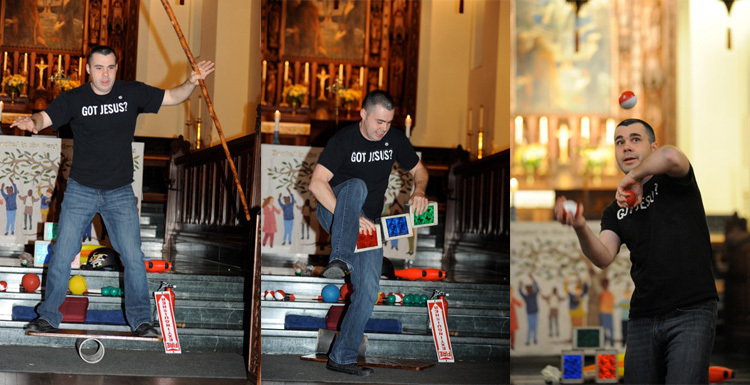 We offer Christian witness through bible game shows, Christian juggling, Christian magic, and Christian musicians. All of the entertainment which we offer is uplifting, humorous, faith filled, and non-denominational. Many people who visit our site are expecting clown ministry. 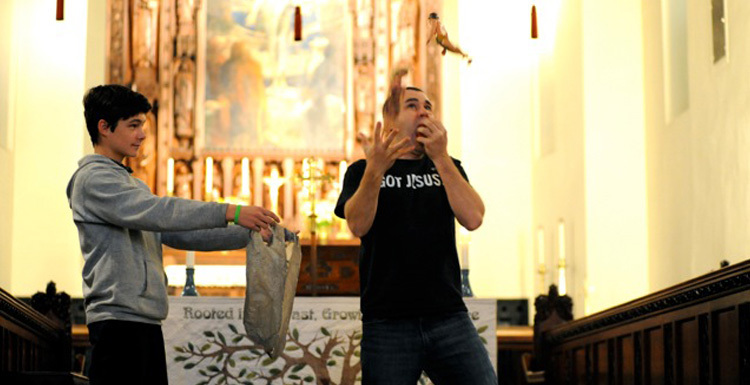 Clown ministry is a wonderful way of spreading the gospel through imaginative play and pantomime. Unfortunately it's not exactly what we do. For one thing we're not clowns. We don't wear makeup, in fact we're usually in dress cloths. We prefer to think of ourselves as interactive Christian Performers, or perhaps Christian prop-comedians might be a better title. Either way our shows are geared to an older audience. Your kids will love the juggling and the magic, and they'll enjoy hearing familiar stories, but it will be your adults who rave about us. 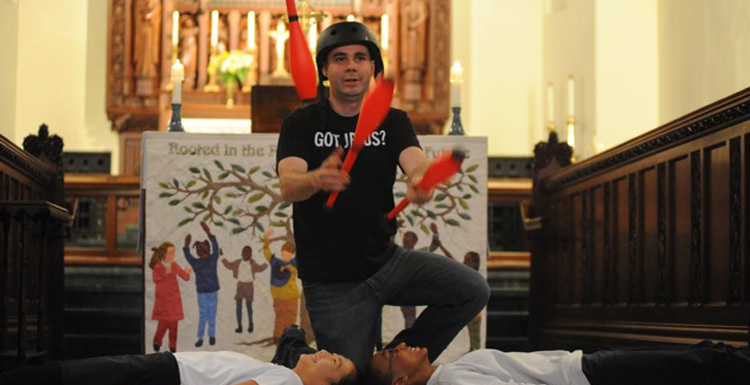 Our shows really are a Christian witness for adults. 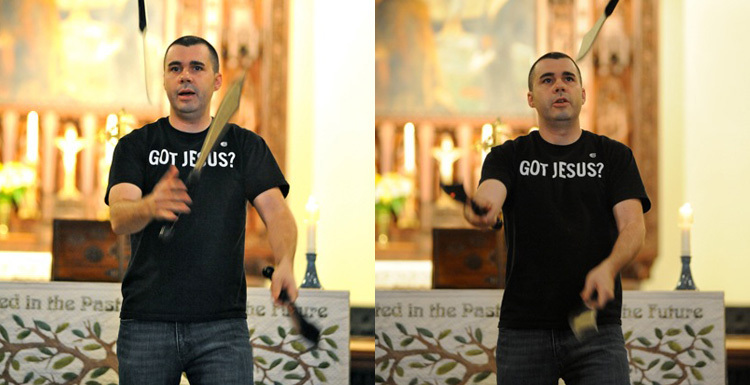 Just yesterday I was performing at a Lutheran Parish in Indiana, one gentleman came up to me and said, "I don't like jugglers, but I loved your show. You were really good, and I don't even like jugglers." At the same parish several people came up to me and asked for cards for other parishes, and when they were done the pastor came over and asked for the rest of my cards, explaining that he knew a lot of pastors. God has blessed us with our lives, our families, and our gifts. 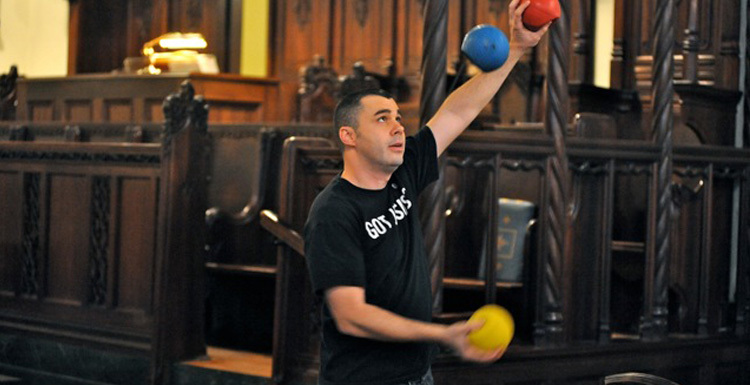 Some day I may have to retire from juggling, but I'll never stop witnessing about God.